Odysseus and Penelope: The Long Journey showcases the work of Kari Halker-Saathoff, who has always been fascinated with stories of adventure. With this exhibit, Kari reimagined the timeless and transcendent story of The Odyssey, a story that has stayed with her throughout the years. In creating her interpretation of Homer’s Odyssey, Kari fashioned images on twelve vessels that represent Penelope’s remarkable story while twelve of her drawings tell the story of Odysseus. The placement of the vessels between the drawings forces the viewer to circle each piece in order to experience Penelope’s struggles. 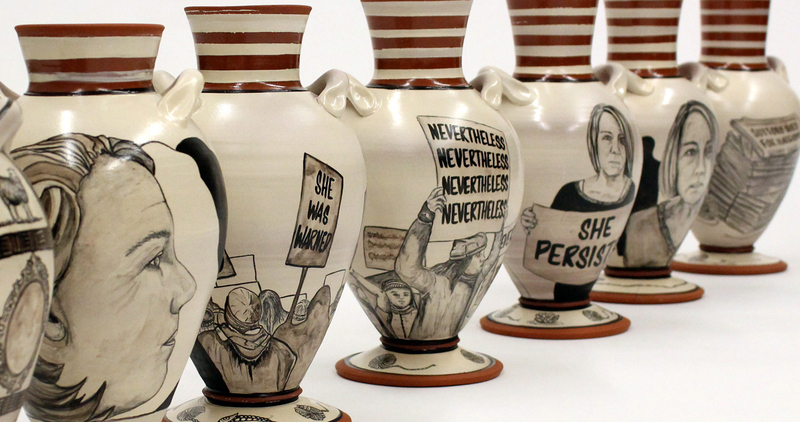 While many of the illustration titles are inspired by the text of the Odyssey, the titles accompanying each of Penelope’s vessels are inspired by the Women’s March of 2017, as well as current news stories. Kari's ambition for this show is to illuminate the many parallels between the present and 650 B.C.E.